Please note, every third-party OTA sends different information to channel managers, for example, some channels will send Net Rate as Sub Total while another can send Gross Rate as Sub Total. 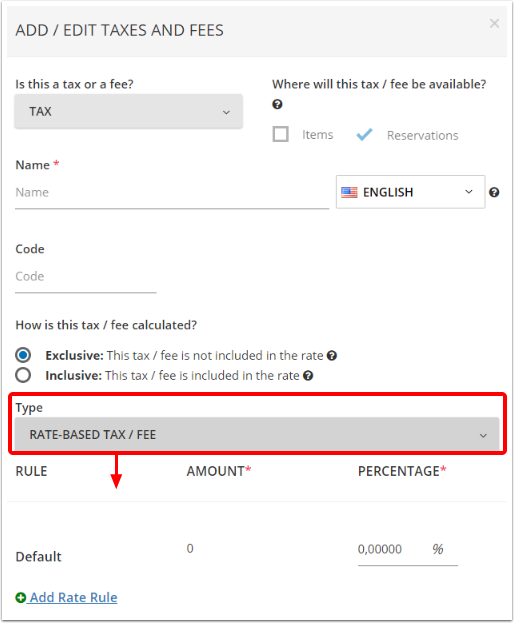 When setting up the tax, a user would select a new tax type - Rate-based Tax/Fee. This will allow to create a series of rules. Each rule means the following: If the nightly rate is greater than or equals a certain nightly rate amount, then the tax will be a certain percentage of the booked nightly rate. Beginning with the default rule, the system considers that any room rate which is greater than 0 calculates certain percentage of nightly rate (0% by default). Anything greater than the price in new rule will use the entered tax tier; anything below it will be exempt. The user can continue to add rules as is required which will create tiers. To apply the tax to the reservations automatically the user will need to apply the tax to the specific reservation source(s). Indian Government requires that you setup CGST (Central Goods and Service tax) and SGST (State Goods and Service Tax) taxes. You can create a tax called "CGST" first, then create the tax "SGST"
8. Select type "Rate-Based Tax"
11. Amount - enter the amount according to rule "if greater than [amount] the tax will be [percentage]"
12. 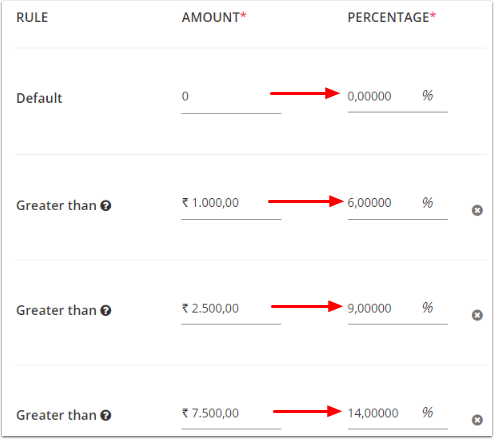 Percentage - enter the amount according to rule "if greater than [amount] the tax will be [percentage]"
Add more rules if needed by following steps 9 and 10. Please note that rate-based taxes are based on the transactional value, and therefore will not work with all third-party channels (unless you have only one rate tier). Every third-party OTA sends different information to channel managers, some channels will not send the nightly rates which in some instances could result in the wrong tax tier being used. Although in myfrontdesk taxes can be configured to specific sources, rate-based taxes will work correctly only with all Primary Sources. 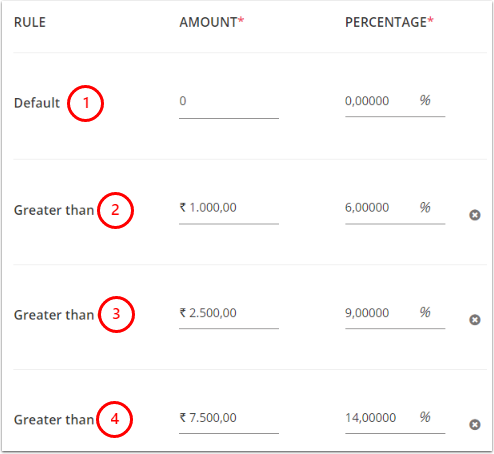 How to Configure Rate-Based Tax for different OTAs? How this channel sends reservation rate to myfrontdesk? 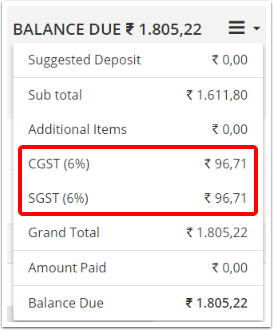 Is it possible to setup GST on Extranet? What is the recommended GST setup for this OTA? How to set up tax specifics on the invoice? On invoicing settings tab , you can enable an option to show 'Tax Specifics'. If enabled, and you have multiple taxes, a breakdown of the total of each tax will appear at the top of the invoice. If this tax type does not appear on your myfrontdesk account - please contact our Support Team at support@cloudbeds.com or get in touch with your Cloudbeds Market Manager. Do distribution channels support the additional guest prices set in myfrontdesk?